NDC lacks quality of the current EMT: Likely to be in opposition for a very long time - NPP UK Secretary Predicts. 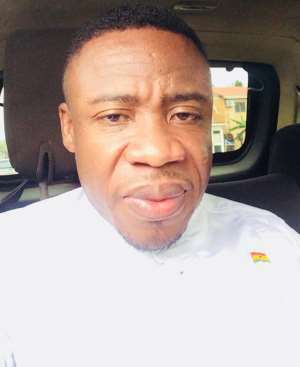 The Branch Secretary of the ruling government in United Kingdom, Dr Da Costa Aboagye has predicted that the NPP is likely to be in power beyond 2024 due to the ongoing good work by the economic management team headed by H.E Dr Mahamudu Bawumia, Vice President of the Republic of Ghana. Speaking exclusively to MyNewsGH.com after the town hall meeting, Dr Aboagye said the foundation of every country’s success depends on the strength of her economy. According to Dr Aboagye , looking at a very weak economic performances under former President, John Mahama, when Ghana operated under a life support credit facility from the World Bank to stabilise the macroeconomic environment, policy credibility, a fast depreciating cedi, the current EMT’s remarkable performances significantly reversed a disastrous and distress situation within two and half years. Between 2015 and 2016, Ghana’s economy was at its lowest with an overall GPD growth around 3.7% and 3.4% respectively. “He stated”. The hard work and good choices of the current EMT speaks for itself with a very good overall GPD growth of 8.1% in 2017 and around 5.6 % in 2018. The non-oil GPD growth remained around 4.6% in 2017 compared to the same period in 2016 but the 2018 non-oil real GPD growth rose to 5.8%. He asserted. On the recent cedi depreciation, Dr Aboagye had earlier on suggested that the depreciation had nothing to do with the strong fundamentals of the economic but mainly due to the exiting of the IMF and external determinants. Dr Bawumia, in presenting the state of the economy also noted that the cedi fall was largely due to external factors rather than weak fundamentals of the economy, unlike, in his opinion, it pertained in 2014 when he (Dr Bawumia), famously said: “If the fundamentals are weak, the exchange rate will expose you”. According to Dr Bawumia, “Factors such as the inflation rate, the balance of trade, the fiscal balance, money supply, are what we refer to as the fundamentals. But speculation and expectations about these fundamentals; external shocks such as oil price increases, can also have powerful short-term effects on the exchange rate. “Ladies and gentlemen, you will recall that I stated in 2014 that: ‘If the fundamentals are weak, the exchange rate will expose you’. That was true then and it’s true now. It is 100 per cent correct. “ Dr Bawumia narrated”. He further argued that “it is warped logic to jump from that to a conclusion that if there is depreciation in your currency, then the fundamentals must be weak”. Do you understand the logic? If the fundamentals are weak, the exchange rate will expose you, but if the exchange rate moves, you cannot jump to that conclusion that the fundamentals are weak. That defies logic” Dr Bawumia said, adding: “There could be external factors causing the exchange rate depreciation”. Dr Aboagye was hopeful that the choices of economic policies being implemented by the current EMT will soon yield the needed results to better the lives of Ghanaians. These will actually make Ghanaians vote massively for the NPP in 2020 and even beyond 2024. He noted that when the benefits of the economic indicators are felt in the pockets of ordinary Ghanaians, it will take a very long time for the NDC to come close to power.